Read Numbers 1-2 at Bible Gateway. A phrase that is repeated over and over again, is, “all who were able to go to war.” This clue reveals to us the purpose of the census: to number the men of military age in Israel, to set them in their armies. You see, Israel is not going to stay at Mount Sinai forever. The tabernacle is now built, the priesthood is now consecrated, and the sacrifices are now being brought. Soon it will be time to move, to continue toward the goal of entering the Promised Land! And in order to enter in, Israel will have to fight. There will be Canaanites and who knows who else who will oppose them. So Israel is going to have to fight and wage war to inherit their promise. Now God could just blast all the Canaanites in their path with His power, and Israel could just enter in unopposed. Why doesn’t He do that? The Torah is a book of history-prophecy. True history, that also prophesies to us of natural and spiritual truths and realities for our day. He is preparing Israel for war, because we also are in a war. We also have to fight and wage war to inherit our promise. God is not just going to blast all our enemies (who are all principalities and powers of wickedness, Eph 6:12) with His power so we enter in to our promise unopposed. This book of Torah is going to teach us how to prepare for and wage war! The first thing we learn, is, MEN, prepare yourselves for battle! The men in the kingdom of God are on the front lines. Do you ever wonder why so many women are called to be intercessors? Women are not on the front lines. Also, the men are 20 years old and upwards. Children are not on the front lines. This destroys the common argument that Christian parents give for sending their children to the cesspool of public school in order to act as lights in the darkness. We are to protect our children from war, not throw them in the thick of it. That is what the Scripture teaches. For further study: I have found three chiastic structures so far in Num 1-2 and I believe there are more. God’s paragraph divisions will help point them out. Can you find them? What are the central axis’ and why has God placed neon flashing lights around those passages? 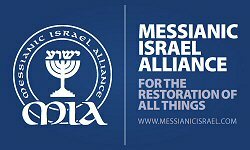 Finding Messiah: Yes, Messiah is even found in these chapters! Notice that God gives specific instructions for how Israel is to camp in Num 2, with the tabernacle of the Testimony (so called three times in this passage – three! a sign of Messiah! Not called the tabernacle of meeting here, on purpose) in the center. 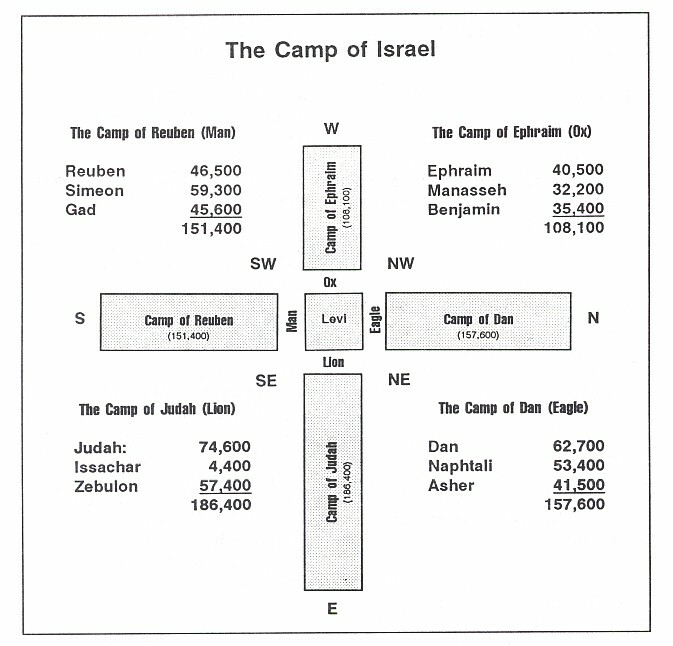 The camp of Judah, the largest encampment, camps eastward; the camp of Reuben camps southward; the camp of Ephraim camps westward; the camp of Dan camps northward. If we were to take an aerial picture of this, we would find the cross! And who is in the center of the cross (on the cross)? GOD! First census was of males 20 years and older that could go to war. YHWH chose twelve to do this, one from each tribe. What is striking here is that the tribe of Gad named 11th in the order of the choice of leader, is moved up to be included with Reuben and Simeon. Was He making the adjustment on the basis of the numbers?? My answer would be a yes.